There is an art to putting your china cabinet together when you combine your functional dinnerware with other accessories and I will gladly help you learn how to make it beautiful. I really should have added the decorating or accessorizing of china cabinets to my article about the biggest decorating mistakes. For some reason many people think that their china cabinet is simply a storage piece. Well, you are partly right. The main storage space is below in the cabinet with the “opaque” wooden doors. The glass cabinet doors above usually close over glass shelving and accent lighting. Glass shelving and accent lighting is used in department stores to display fine china, porcelain knick knacks and even jewelry….all things they want you to think are beautiful and then they want you to buy them. 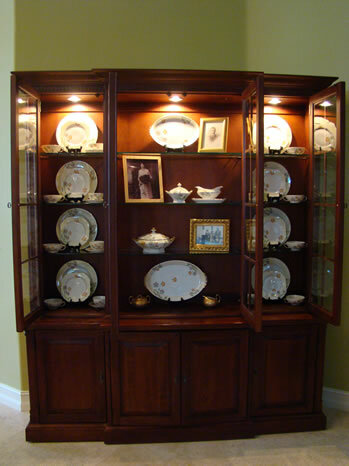 In your home, the upper portion of the china cabinet is meant to hold all the special china, crystal, and objets d’art you have collected over the years. It is NOT a place for tax papers, recipe boxes, tablecloths and stacks of dishes. OK, have I ranted long enough?? I think so because I’m tired of it myself! 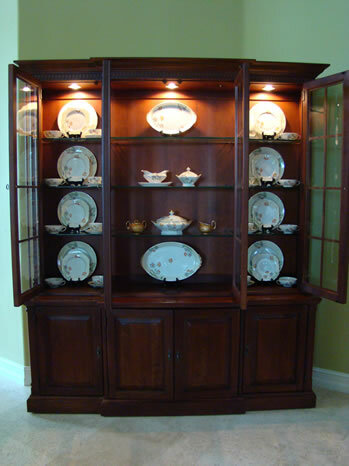 When it comes time to “dress” your china cabinet, I want you to think of it differently. 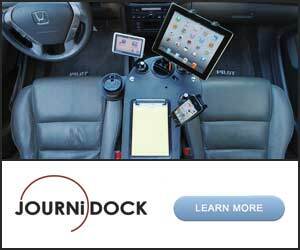 This is an opportunity to show off some of your favorite things. It is also a chance to see what additions you might need to really bring the whole display together. That means shopping. And, shopping around for little “deals & steals” on these types of things is fun. I also want you to consider changing out the décor in your china cabinet for the seasons. That doesn’t mean you need a dinnerware set for each season. 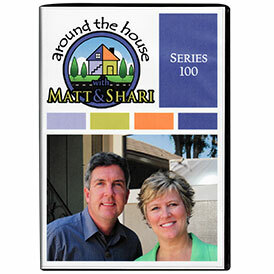 It means you might enjoy changing out the “accessories” to your dinnerware each season. It’s just a suggestion for those of you who enjoy this whole process. If you want to get it done once and let it sit, let’s move on. 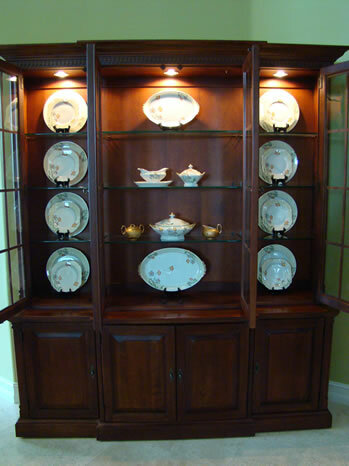 The first step in getting your china cabinet in order is to remove everything and start over. Eliminate the items like those I mentioned earlier that have no place behind glass doors! 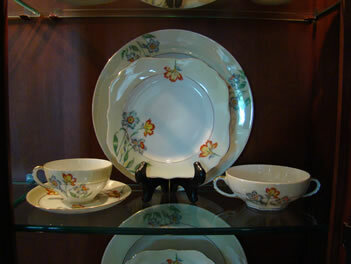 Next consider your china or dinnerware or perhaps a lovely collection you’d like to display. In most arrangements, it’s best to place the largest, most dominate pieces first. If you have a collection of flower vases they would probably go in first because of their height. Maybe you have china with the completer set of a pitcher and covered casserole or other special items that could be focal points. Sometimes it’s just the dinner plates that go in first because of their size. When you place whatever items you are putting in first, do it with style. Center the flower vases in the windows of the china cabinet doors. Put the completer set items right in the middle of the entire cabinet, making them the center of attention. For dinner plates, place them on plate stands so their lovely pattern or shape can be shown off. Spread them evenly throughout the shelving and get ready to do some layering because using dinner plates only on an 8-10” shelf will make them look lonely. But remember, you have the entire place setting to work with! In this display, the dinner plate is the background, the uniquely shaped dessert plate shows up nicely in front of it when placed on a plate stand. Add the cup and saucer and a special soup bowl and the shelf looks complete. 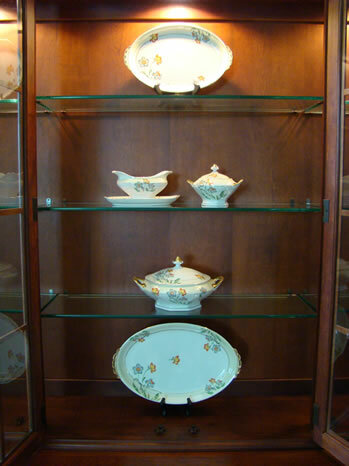 Stack your display on multiple shelves and your china cabinet really starts to take shape! Ok, you’ve made great progress and it’s time to step back and think about what else you could add to give your fine display some pizzazz. Over the years I have added silk flowers in and among the dinnerware either just lying on the shelf or in tiny glass vases. Interspersing a collection of salt & pepper shakers would be nice. I’ve seen porcelain figurines, trivets, wine glasses, greeting cards, ornaments, all sorts of things added to these displays to make them special. As you can see, I added framed black and white photographs to the center of my display. The photos are of my grandparents, who gave me the china that is displayed. In other words, the addition of photos to the cabinet make sense, they complete the story I’m telling. 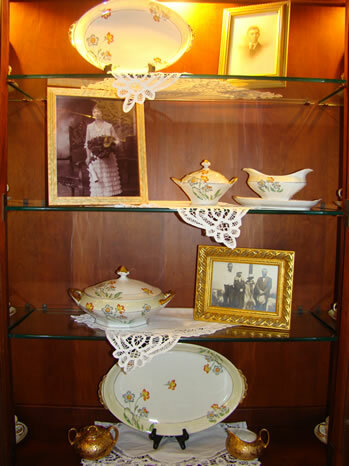 I didn’t add flowers to these displays because my grandmother didn’t like flowers…odd, but instead I placed lace doilies on the center shelves that held their photos further emphasizing the center area and as well as the antique quality of everything in the cabinet. With the addition of the lace I stepped back and felt confident my display was complete. I closed the doors to the china cabinet and stepped back one final time to make sure that the photos were placed correctly to be seen through the double doors. 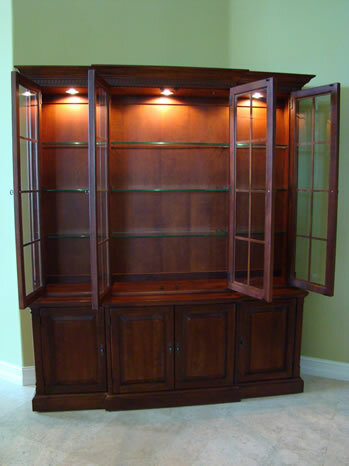 Because of the configuration of this particular china cabinet, anything placed directly in the center gets hidden by the wood frames of the doors, so sliding things a bit left or right is always needed. Once you have your display complete, I’m sure you won’t want to rush right out and change it. Just remember that adjusting things for the holidays can be a lot of fun and it doesn’t have to cost an arm and a leg. 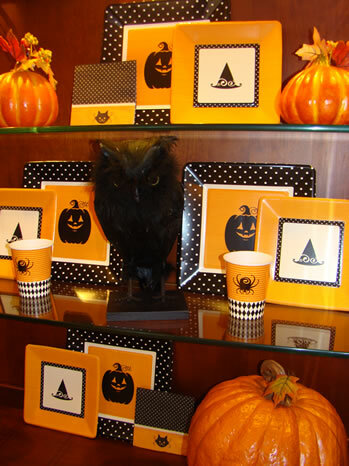 For instance, I pulled together this fun Halloween display by using the leftover paper plates, cups and napkins from last year! Add a pumpkin, black cat or bat, and you’ll have the kids “howling” at your show of Halloween spirit! At every holiday, I use the center section of my china cabinet for a display. My collection of carved Santas looks great with my holiday china around them. Valentine’s Day can be fun as well as Easter, or just think about altering your accessories for the seasons instead of each holiday. Whichever way you go, I hope you enjoy the fun of decorating and creating a beautiful china cabinet. Thank you for showing me how to start a very large project. All I needed were the stepping stones … now I feel more confident. Are you placing ‘both’ the dinner and salad plate on the same plate stand? And if so, is it the large stand? Hi Karen, no I used a larger stand for the dinner plate and a smaller one for the salad plate, just nestled them in tight! Hi, Where did you get your large and small plate stands from? Hi Susan, I found mine at Bed, Bath & Beyond. already in the wood and glass shelves? Hi Kim, I use the grooves in my shelves in some cases because a couple platters I like to display are too large for the plate stands. I just like it better when the bases of all the plates are up a touch and they can be seen better. Hi Patricia, I don’t think it has to be as full as mine. The one I did was full because we had many items to fit in the cabinet. If you have fewer, that’s fine, just make sure it looks like a china department display cabinet! The prettier the better. 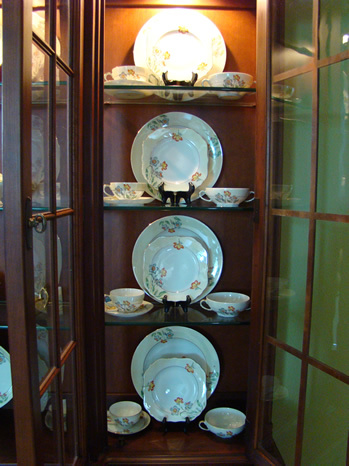 I have 40 inches of empty space on both sides of my china cabinet (8 foot ceiling, height of cabinet about 7 feet). What kind of decorations/accessories do you suggest I should use to fill these empty spaces? Hi Jusil, you have lots of options. Is there any chance you have extra dining chairs? Often dining chairs flank a china cabinet and can look nice since they are not as tall but help create an oval shape on the wall when observed with the tall china cabinet. I often place artwork on either side of my china cabinet where two or more pieces are thematically similar so they make sense. How about mounting two wall sconces for candles or two wall vases, one on either side? At the moment, floor vases aren’t thrilling me, how about you? 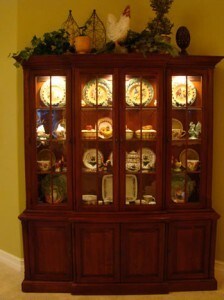 I have a China cabinet exactly like that, that I inherited. What is a good selling price? Kaylynn, Wow,I’m not sure. It’s by the Lexington Furniture Company and it was rather expensive I thought when I bought it. Maybe you could take some photos of it and check your local used furniture store. Or have you tried to post it on Craig’s List? You can find things of similar quality by searching for them, adding as much detail to describe it as possible. I think I’d start there. This is a great post and tutorial. I used it today as a guide. I love the plate easels. They are a wonderful addition. Thanks for taking the time to share your cabinet and expertise. We bought a cool Drexel china cabinet off of CraigsList with the intention of using it as a cooling cabinet (we have cats ) for $50, made in the 60′s. It had a dated finish, so I painted it antique white, bought some new ‘vintage’ hardware, we took out the glass in the doors (it already had a diamond-shaped wire design, similar to chicken wire in the doors as well), and it’s perfect. I store pretty pottery and such on the top two shelves, and on the bottom I have Wilton stackable cooling racks. It looks like something out of an old-timey bakery. It sits in a hallway off of the kitchen, which gives that otherwise useless space some great life. I also got a VERY nice Woolrich (yes, they make furniture, too) hutch that I traded a handmade quilt for (I found a similar hutch online for $2000), and it sits all lonely in an unused corner of the living room. We have knickknacks in it, but I’d love to put something nicer. I really like the idea of stacking quilts, and pretty vintage fabrics, but also going with a seasonal theme. Maybe I can find a way to combine the two! Thanks for all of the great ideas! I have 2 sets of China. One is my great grandmothers (100+ yrs old) and a recent set i received from my Mom. How would you decorate with 2 sets or should i display one and put the other in storage below? Jennifer, I love your idea of storing one below. 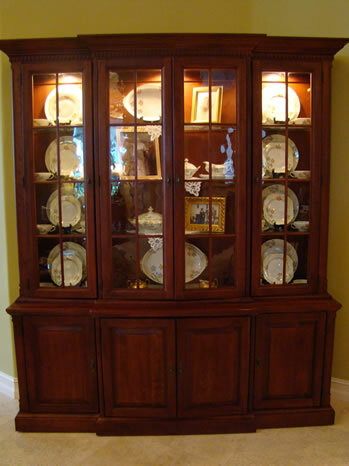 Why not change them out throughout the year to give your china cabinet a new look? Yes a lovely display and it has helped me tremendously !!! Thank you for your time and expertise. NOW to find those plate holders, LOL…. I don’t suppose you still have the exact name/model of your china cabinet? I saw on an earlier post you said it was from the Lexington Furniture Company, but I’m having a tough time finding it. My fiance and I saw your cabinet in a google search and this is the first one we’ve both loved! Help please! Hi Kelly! Oh my gosh, I bought that piece almost 20 years ago….I checked on the Lexington site and I didn’t see it either. I’m sure it’s discontinued by now. I’m sorry I can’t help you with this one! 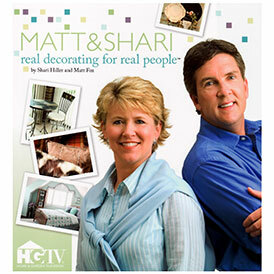 When I decided to tackle my China cabinet I knew just what to google “China Cabinet Shari Hiller” Thanks Shari and Matt!